Don’t Let an Personal Injury Accident Ruin Your Credit! Medical bills add up quickly after a serious injury. Ambulance and hospital bills alone can be thousands of dollars. You may also need follow-up care with your primary care physician, specialists such as orthopedists and neurologists, physical therapists, and radiologists for x-rays, CT or MRI. Don’t let anyone tell you otherwise; you ARE responsible for these bills. So, how do you make sure they get paid and you preserve your credit score? Present a copy of your health insurance card to any medical provider you see for your injuries. If you are uncertain whether a medical provider has the correct insurance, a quick call to the number on any bill you receive can confirm the medical provider has your health insurance information. If you have more than one health plan (such as Medicare plus a supplemental plan), be sure to provide the information for each. Most people ask "why should my insurance company pay if I wasn't at fault?" Those responsible for your injuries will be held responsible in the end. Explanations of Benefits (EOBs), Explanations of Review (EOR) and any medical bills you receive are very important. Never assume our office has received the EOB, EOR or bill. Some providers will send a bill to you and not to our office. Make a copy of any medical bill you receive and send it to us for review. Your medical providers may be able to set up payment plans for you to prevent bills from being sent to collections. Many hospitals are willing to work with patients. Keep track of all payments you make to a medical provider so those amounts can be included as part of your "damages" when your claim is submitted to the insurance company for the at-fault vehicle. Many medical providers will defer collecting for medical treatment until your case settles if there is a signed Letter of Protection (LOP) with your attorney. An LOP is an agreement in which the client authorizes the attorney to pay medical providers out of the settlement funds. When an LOP is issued to any medical provider who agrees to accept it, that promise to pay must be resolved before funds are distributed to the client from a settlement. That means an LOP cannot be ignored. There is no requirement the medical provider reduce the outstanding charges when the case is settled. While it is very common for providers to reduce their charges, they are not obligated or required to do so. Our standard LOP has a clause indicating any reduction would be on a pro rata basis with all other providers if there are insufficient funds at the end of the case to make everyone whole. Not all medical providers will work with LOPs; in particular, most ambulance services and many hospitals will not. It is not always in your best interest to treat on an LOP. You should discuss any LOPs with our office. If you have health insurance, it is always in your best interest to use your health insurance once you have used up the available PIP. The reimbursement to your health insurance company after your case settles is often substantially lower than if your medical provider treats you on an LOP. For this reason, it is recommended you consider choosing medical providers who are "in-network" on your health plan. Our office does not issue LOPs for bills under $100. If you receive a bill for a small balance after insurance has been processed, you are responsible for paying it or working out an agreement with your provider. Remember -- Never ignore a medical bill. Make sure you know whether it has been submitted to insurance, is under an LOP, or is your responsibility to pay. Many providers will send unpaid bills to collection. Never assume our office is aware of a bill or how it is to be paid. If you are having trouble with your insurance company or your medical providers, contact our team for help. 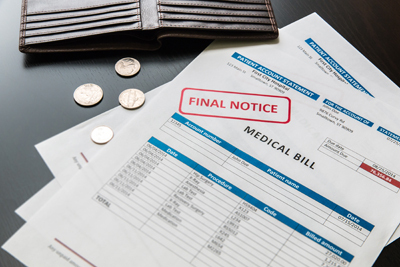 While we cannot prevent a medical provider from sending your bills to collection, we can often assist in resolving billing issues.